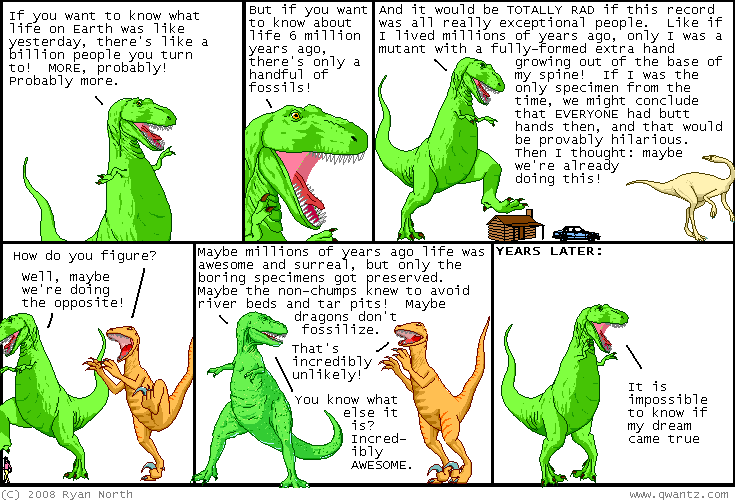 Dinosaur Comics - September 5th, 2008 - awesome fun times! –I'm serious! This is a big concern for me! September 5th, 2008: Here are some awesome links for you! Oh yes. First up is this video by London, Ontario rapper Shad. Not only is it FRESH PRINCE OF BEL-AIR style, my friend Steph worked on building the set, which meant she got to re-create the Fresh Prince title sequence sets. This sounds like the best job ever. Good work Steph! Next up I wanted to link to Bernie's new comic, If You See Something. You may remember Bernie from the hilarious Alien Loves Predator - he's doing this comic now and I really repect doing something new like this! I also think the fourth panel of this comic is freebased SOLID GOLD. Finally I wanted to direct you to Todd Diamond, Self-Made Potential Millionaire, oh yes. Okay I think that's it for now! One year ago today: backstory: yesterday dromiceiomimus jennifed a dude?